St. Peter's (German) Roman Catholic Church was founded in 1854 as a mission. 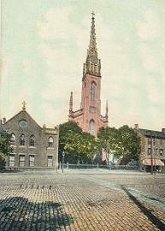 On February 2, 1855 the parish was founded. The church building was dedicated on October 27, 1862. The parish school was erected in 1887 although it was around since 1855. St. Peter's Orphan Asylum on Lyons Avenue was founded in 1897. Forms used for recording information (& most information) are in Latin. Baptisms 1889-1894 are in English. Communions are in English too. There are individual indexes for most volumes of baptisms and marriages. The marriage indexes are for the groom only.